Indium Corporation will feature Indium8.9HF and Indium10.1 Solder Pastes at SMTA Queretaro Expo & Tech Forum on July 12 in Juriquilla, QR, Mexico. These exceptional materials help increase reliability by allowing assemblers to Avoid the Void®. Indium Corporation, the industry-leading source of void-reducing materials and performance, has specifically formulated solder pastes to reduce voiding significantly below the industry average for improved finished goods reliability, while maintaining the other important process performance attributes that our customers are accustomed to. Indium8.9HF Solder Paste is a no-clean, halogen-free solder paste that delivers low-voiding, as well as versatility and stability in the printing process. Under optimal process conditions, Indium8.9HF delivers excellent response-to-pause even after being left on the stencil for 60 hours. Indium10.1 Solder Paste delivers our lowest voiding performance, along with excellent print transfer efficiency and response-to-pause performance. In addition, it provides robust reflow capabilities and a wide processing window, which accommodates various board sizes and throughput requirements, and minimizes defects, such as head-in-pillow and graping. In addition, Indium Corporation will feature its “no-spatter” flux-cored wire, Core 230-RC. Core 230-RC is REACH- and RoHS-compliant, and J-STD-004B tested and compliant. It delivers an exceptionally impressive 0.09% total flux spatter, as tested per IPC TM-650 2.4.48. “No-spatter” is important to ensure that flux does not contaminate gold fingers or other contacts where it can interfere with circuit board electrical properties or spatter hot flux on operators’ hands. It is available in lead-free, tin-lead, and high-lead cored wires. Lead-free cored wire is available in diameters from 0.008” (0.2mm) to 0.125” and flux weight content from 1.0% to 4.5%. 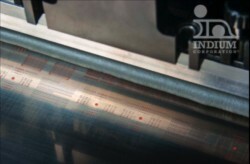 For more information about Indium Corporation’s low-voiding solder materials, visit www.indium.com/avoidthevoid.